How does the weekly ranking work? On Sundays, the prize is awarded to the winner and weekly points are reseted to start the following week ranking. 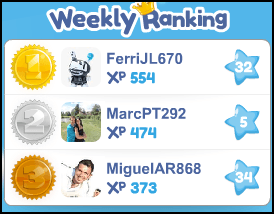 Besides the winner of the week award, the top 3 in the ranking will get an achievement that will give them both experience points as well as many coins. Remember! The prize for getting the achievement you will receive only once. Go for the prizes!